The timber industry in Malaysia retracted slightly in 2007 amidst intense global competition, rising fuel prices and raw material constraint. Malaysia's export of timber products recorded a figure of RM22.7 billion, down 3.1% over 2006's earnings of RM23.3 billion. The shortfall was attributed to the global effect of the US subprime mortgage crisis which slowed down demand in most of Malaysia's export markets. The timber trade sector accounted for 3.7% of Malaysia's total export earnings and was the fourth largest export earner after electrical and electronic products; palm oil and palm oil-based products; and crude petroleum. Overall, the timber trade contributed 4% of the nation's GDP. Wooden furniture topped the chart as the leading export item with RM6.7 billion or 29.3% of total timber based exports in 2007. This was followed by plywood and sawntimber with total exports amounting to RM6.3 billion or 27.6% and RM3.2 billion or 13.9% respectively. Logs contributed RM2.1 billion while Medium Density Fiberboard (MDF) and Builders' Carpentry and Joinery (BCJ) each contributed over RM1.0 billion respectively. Japan, USA and Korea remained the top three export markets for Malaysia's timber products. In 2007, 21.4% of Malaysia's total timber exports valued at RM4.9 billion went to Japan. USA remains the second most important market, contributing 12.8% to the total of Malaysia's timber export earnings. However, the slowdown in the US market also affected exports of major products such wooden furniture, plywood and joinery products and value of exports to USA amounted to RM2.9 billion, a decrease of 18.2% over the previous year. At third place, Korea accounted for RM1.1 billion or 5.0% of exports from Malaysia. The slowdown in the timber industry felt in 2007 could be clearly demonstrated by the declining numbers in the export of Logs. Export receipts from logs fell by 6.6% to RM2.1 billion while volume decreased by 2.6% to 4,647,429 m3 in 2007. 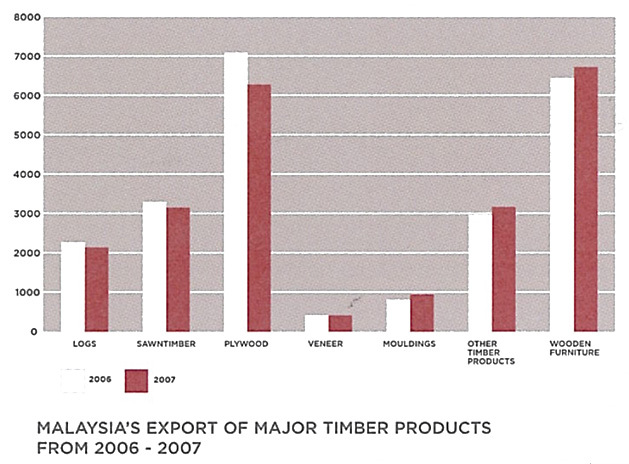 As Malaysia's fourth largest export item, logs contributed 9.3% of Malaysia's total timber exports in 2007. India remained as the largest market for Malaysian logs. 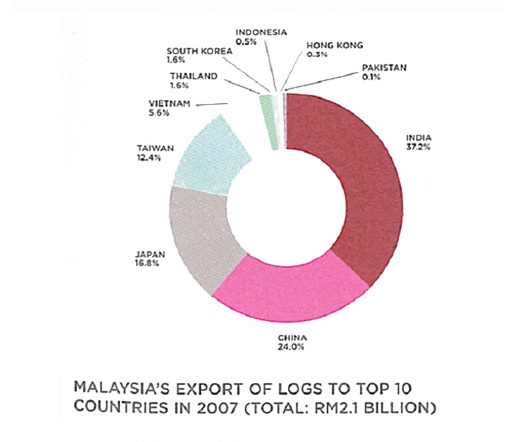 The country accounted for 37.2% of Malaysia's total log exports in 2007. Exports to India grew by 13.3% to RM784.7 million in 2007. This is a big increase from the RM692.3 million registered in 2006. Volume wise, India imported 1,579,118 m3 of Malaysian logs, a significant increase of 13%. In 2007, China imported RM506.3 million worth of logs. Although having taken over Japan's position as the second largest market for Malaysian logs, imports have decreased 3.5% in terms of value. Volume of logs purchased has also decreased 0.4% to 1,183,286 m3. This was attributed to escalating timber prices especially imported timbers and slow development in the Chinese housing and commercial sector. The Chinese market accounted for 24% of Malaysia's log exports. China's downward trend was also mirrored by Japan. In 2007, Japan's intake of Malaysian logs declined sharply by 33.6% to RM354.8 million in value terms and 31.8% to 706,843 m3 in volume compared to 2006. For the period under review, Malaysia's export of sawntimber weakened both in volume and value terms by 4.5% to 2,487,340 m3 and by 3.6% to RM3.2 billion compared to the previous year. 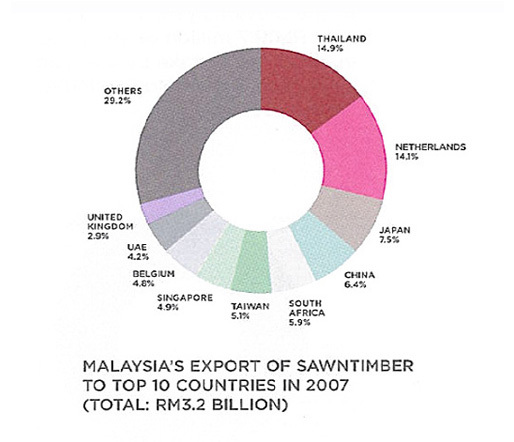 Despite this, sawntimber was the third largest export item, contributing 13.9% of Malaysia's total timber based exports. In 2007, Thailand regained their position as the largest buyer of Malaysian sawntimber with export receipts amounting to RM470.4 million, a healthy increase of 6.0% over the past year whereas volume uptake rose by 3.7% to 631,752 m3. With an uptake of RM445.4 million, 2006's largest buyer The Netherlands, slid to second place with a sharp decrease of 20.7% in terms of value. Naturally, this downward incline also affected the volume of sawntimber exported to The Netherlands where it fell by 31.7% to 134,326 m3 in 2007. Japan maintained its rank as Malaysia's third largest market for sawntimber. However, exports to Japan fell by 3.8% to RM237.3 million followed by a drop of 5.7% in volume to 140,927 m3. In terms of market share, Thailand accounted for 14.9% of Malaysia's total sawntimber exports while The Netherlands and Japan took 14.1% and 7.5% respectively. The Malaysian plywood sector took a turn for the worse in 2007 where the export of plywood declined both in value and volume terms by 11.7% to RM6.3 billion and by 11.8% to 4,372,034 m3 respectively over 2006. 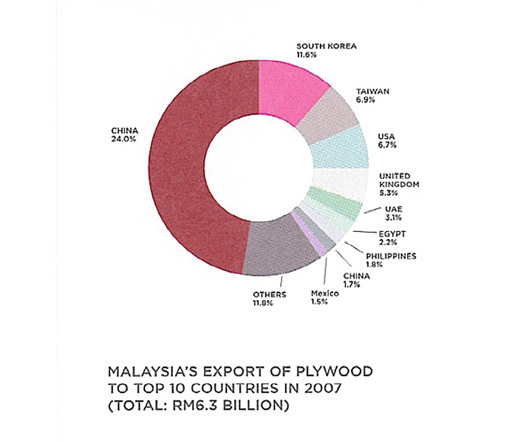 Notwithstanding the global market slowdown, plywood was Malaysia's second largest export item contributing 27.6% of the country's total timber based exports. Japan continued to be the largest market for Malaysian plywood, accounting for 47.4% of Malaysian plywood exports last year. After five years of positive growth, volume of exports to Japan valued at RM2.98 billion decreased by 23.3% to 1,937,933 m3. This is mainly due to Japan's revised Building Standard Act, lower housing starts and increased freight prices. With 11.6% and 6.9% market share each, South Korea and Taiwan ranked as the second and third largest export destination of Malaysian plywood in 2007. Undergoing a robust growth, South Korea increased their import volume by 23.8% to 598,680 m3 valued at RM730.8 million (up 21.6%). This growth spurt was not enjoyed by Taiwan whose import volume shrunk by 7.4% to 353,183 m3 and 3.5% to RM430.8 million in terms of value. Although export volume dropped by 8.7% to 1,125,975 m3, Malaysia's Medium Density Fiberboard (MDF) sector showed an improved performance in 2007 with export takings recorded at RM1.2 billion, an increase of 3.1% compared to 2006. Overall the MDF sector contributed 5.2% to the total of Malaysia's timber exports in 2007. With a record breaking increase of value by 78% translating into export receipts worth RM230.8 million, UAE dethroned Japan by acquiring 19.5% of Malaysian MDF exports, making it the leading buyer for 2007. Correspondingly, the volume of MDF exported to UAE increased by an impressive 58.2% to 203,536 m3. This big jump in Malaysian exports is attributed to the construction boom that UAE has been experiencing in the last five years. Decreasing 1.9% in value, Japan was Malaysia's second largest buyer of MDF with imports worth RM212.0 million. At 179,414 m3, export to Japan amounted to 17.9% of Malaysia's total MDF exports, a positive increase of 11.9% over 2006. At third place, Vietnam accounted for 8.5% of Malaysia's total MDF exports, with import takings valued at RM100.5 million, a decrease of 14.6% from 2006. In terms of volume, there had been a decrease of 28.4% to 116, 530 m3 of Malaysian mouldings when compared to the previous year. However, from only RM19.7 million of import recorded in 2000, the uptake by Vietnam has skyrocketed five-fold to RM100.5 million in 2007. The mouldings sector continued to perform well in 2007, contributing 4% of Malaysia's total timber based exports last year. While the total export of mouldings surged by 14.9% amounting to RM915.3 million, export volume dropped by 16.9% to 341,818 m3 when compared to the previous year. In 2007, The Netherlands usurped Japan's traditional position as the largest export destination of Malaysian mouldings. 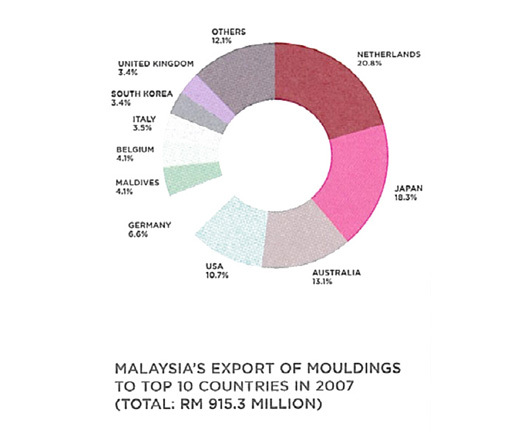 The country accounted for 20.8% of Malaysia's total mouldings exports in 2007, an increase in value by a staggering 38.5%, amounting to RM190.8 million. Likewise, the upward trend could also be seen in the increase of volume where The Netherlands bought 48,954 m3 (up 16.6%) of Malaysian mouldings in 2007. Trailing behind at second place, Japan imported 70,397 m3 of Malaysian mouldings valued at RM167.5 million, an increase of 1% from 2006. This translated to 18.3% of Malaysia's total export of mouldings for the period under review. Australia remained Malaysia's third largest buyer of mouldings with imports worth RM119.6 million. Proving itself as another important market for Malaysia, Australia registered a positive growth of 14.8% in value over 2006, accounting for 13.1% of Malaysia's total mouldings exports. 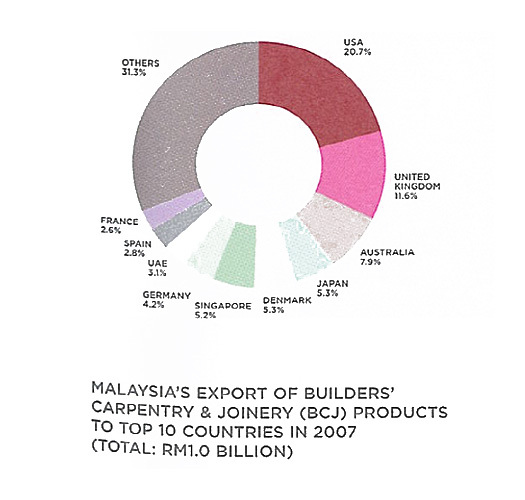 In 2007, total export of Builders' Carpentry and Joinery (BCJ) products slid by 0.9% to RM1.0 billion, accounting for 4.5% of Malaysia's total timber based exports. However, wooden flooring made impressive export gains and together with wooden door and frames, accounted for 71.3% of the country's total BCJ exports in 2007. In 2007, export of wooden doors and frames increased by 3.7% to RM366.2 million, making up 36% of total BCJ exports. USA was the leading importer with an uptake of RM108.5 million. UK and Australia retained their ranking as the second and third largest importers with total imports amounting to RM100.7 million and RM35.0 million respectively. As for wooden flooring, the product made up 35.3% of BCJ's total exports, registering a 9.2% hike to RM359.6 million. In 2007, the largest market for Malaysian wooden flooring was Denmark with import value of RM53.4 million. Trailing behind was USA and Australia with imports of RM52.7 million and RM39.0 million respectively. Overall, USA remained the leading market for Malaysian BCJ with an uptake of RM210.9 million, down 32.1% when compared to imports in 2006. The UK maintained their position as Malaysia's second largest market with purchases worth RM118.1 million, an encouraging rise in value by 21%. Australia replaced Japan with imports of RM80.7 million, an increase of 20%. 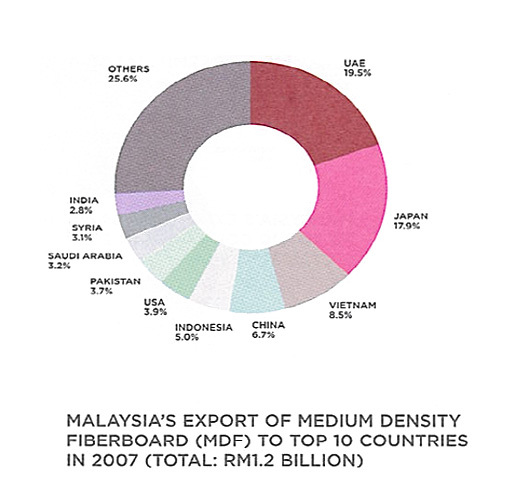 In 2007, Malaysia ranked within the top 10 furniture exporters in the world. The demand for Malaysian furniture had increased significantly over the last few years, with Malaysian furniture exported to over 180 countries. From 2000 – 2007, Malaysian furniture exports surged an impressive 49.6% to RM6.7 billion in 2007. With total exports of RM6.7 billion, wooden furniture was the largest contributor accounting for 29.3% of Malaysia's total timber based exports. For the period under review, export receipts of wooden furniture rose 4% compared to the corresponding period in 2006. USA remained as the largest single market for Malaysian wooden furniture. 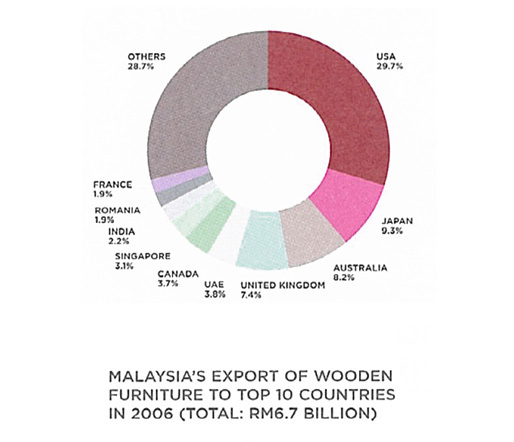 The country accounted for 29.7% of Malaysia's total wooden furniture exports in 2007. However, exports to USA in 2007 decreased by 11.2% to RM2.0 billion compared to the previous year. Exports to other major countries such as Japan, Australia and UK were recorded at RM621.6 million, RM549.8 million and RM494.3 million respectively.